Topics: Insurance, Mutual Funds, State Farm Bank®, Directions, and Report A Claim. Its 2 nameservers are dns2.register.com, and dns1.register.com. Its web server is located at Linode New Jersey. 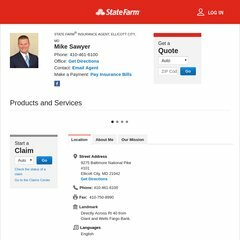 Mikesawyer.biz's server IP number is 96.126.119.20. PING (96.126.119.20) 56(84) bytes of data. A ping speed test response, is timed at 36.8 ms.
CP="NON CUR OTPi OUR NOR UNI"